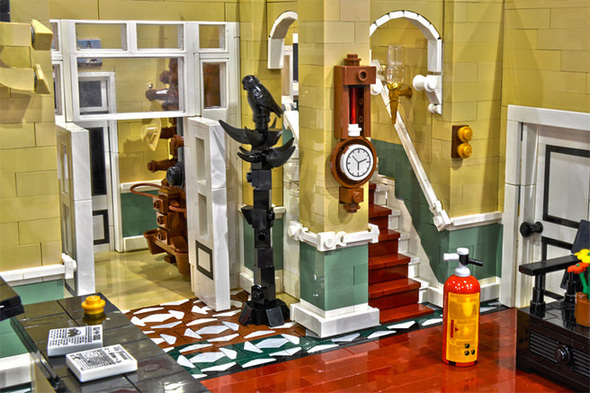 The iconic Fawlty Towers hotel lobby has been recreated out of LEGO. 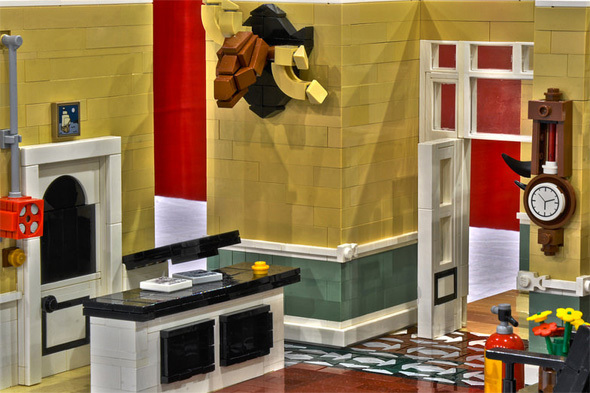 Skilled LEGO builder Nathan Feist, 21, made the model for the annual BrickFair LEGO convention in Virginia, complete with the staircase, lobby and reception desk from the classic BBC comedy, Dangerous Minds reports. His model even features the fire alarm, extinguisher and moose head with broken antler, which refer to 'The Germans' episode. Feist posted photos of his model on a Eurobricks.com forum and wrote: "Here are some photos of my newest model I displayed at BrickFair VA this past weekend, a diorama depicting the set of the classic BBC Two sitcom Fawlty Towers." He added that he plans to "modify this and post another set of photos once I get some parts I don't yet own and will maybe even build the upstairs or exterior." According to Metro, Feist said: "I considered Number Six's house from The Prisoner which I eliminated early on as I had seen a good LEGO model of its exterior and other Village buildings made by someone else not long before. "I had already seen a Counter Strike map that recreated the Fawlty Towers hotel but I couldn't find any LEGO models of the hotel posted online. "So I figured that if someone had only made a good virtual model of it, I should make an accurate physical model." The 5 star Egerton House is a boutique hotel conveniently located in London's fashionable Knightsbridge. The hotel has been meticulously refurbished with style and flair and offers luxury accommodation. Guests will find themselves just a short walk from Harrods and some of London's best known museums. Lauriston Court is, not only, one of the best hotels in the country for customer service but it has also been voted one of the best in the world. The hotel is ideally located opposite the pier on Llandudno promenade making it one of the best positioned hotels in Llandudno North Wales. The family run hotel prides itself on cleanliness and good service. This five star coastal hotel is situated in beautifully landscaped gardens and commands magnificent views over St. Aubins Bay, Jersey, just a few minutes walk from the delightful yachting harbour and village of St. Aubin, where you can enjoy a wide range of cuisine. The Chester Residence in Edinburgh offers accommodation in luxury hotel suites across three elegant townhouses providing all the benefits of a serviced apartments in Edinburgh combined with the luxurious glamour of a five-star hotel. Each apartment features the latest technology and security, fluffy robes, and a range of tempting toiletries, combined with the freedom of staying in serviced apartments in Edinburgh. The Atholl Villa Guest House is a 3 star GOLD B&B situated in the heart of Pitlochry and offers 10 en-suite bedrooms, designed with comfort in mind. The 150-year-old house offers character and original features. Grasmere Hotel is a small Victorian Country House Hotel and Restaurant set in the heart of the English Lake District and on the edge of Grasmere Village. Breakfast and dinner are served in the conservatory restaurant overlooking the secluded garden and the river Rothay. Castlecroft bed & breakfast is situated right below Stirling Castle with stunning views over the Carse of Stirling and the mountains. The B&B is conveniently located on the Lower Back Walk which is a public footpath right from Castlecroft into Stirling Town Centre (about 8 to 10 minute walk) with the castle woods on one side and the King's Knot on the other. The Clarence Hotel is Portsmouth and Southsea's newest and most exciting luxury boutique hotel. The Edwardian residence has been stylishly converted to create eight individually and professionally designed bedrooms and bathrooms with the emphasis on quality and luxury. The award winning hotel is situated only a few hundred yards from the seafront. Portsmouth's Number Four Boutique Hotel offers stunning individual rooms walking distance from the town and seafront. The hotel aims to offer exemplary service, stylish surrounds and modern design flair. The Elmdene Bed and Breakfast offers 5 star guest accommodation in Torquay. The family run hotel takes pride in offering all of its guests high standards of service and attention.